Tasty Minstrel Games will soon be releasing a Steampunk-themed modular board game where players must build devices using components they find along their journey. As a Victorian-era inventor in Steam Works, you will use special starting components and abilities to assemble modular component tiles into unique devices for other players to use. The more you build on a device, the more options you can add. Devices run on clockwork, steam or electrical power based on Tesla’s inventions. Working devices will increase player’s prestige points, as well as help gain resources and more components. The game is based on worker placement mechanics. Players set their characters to work to gather resources and components to build machines and gadgets. 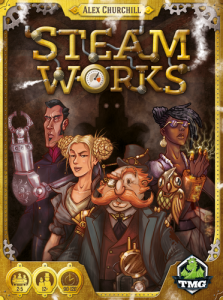 Steam Works supports two to five players, ages 10 and up. It takes approximately 90 minutes to play through one game. It will be available sometime this year at your local board game store. of mechanics, something that has nothing to do with reality, worker placement.